Unwrap the phyllo. With a sharp knife cut the sheets in half. Brush the bottom and sides of a 20 cm x 30 cm rectangular pan with some butter using a pastry brush. Layer one third of the sheets. Every sheet must be brushed individually and on its whole surface with butter- don’t layer them all together. Add over the buttered sheets half of the nut mixture in an even layer. Layer the next third of sheets in the same way. Don’t forget to butter every sheet. Add the remaining nut mixture in an even layer. Top with the remaining third of phyllo sheets buttered. Core the top layer of the phyllo sheets and only that one in order to enable easier cutting of pieces later. Bake for 40-45 minutes until top is of rich golden brown color. In the mean time prepare the syrup. Combine all ingredients in a pot and bring to a simmer over medium- high heat. Continue for about 20 minutes, we need the syrup to be slightly thickened. Remove from heat and discard cloves, cinnamon stick and rind. Allow the syrup to cool a bit. When the baklava is ready take the pan out of the oven. As it is still warm, ladle the syrup carefully over it. 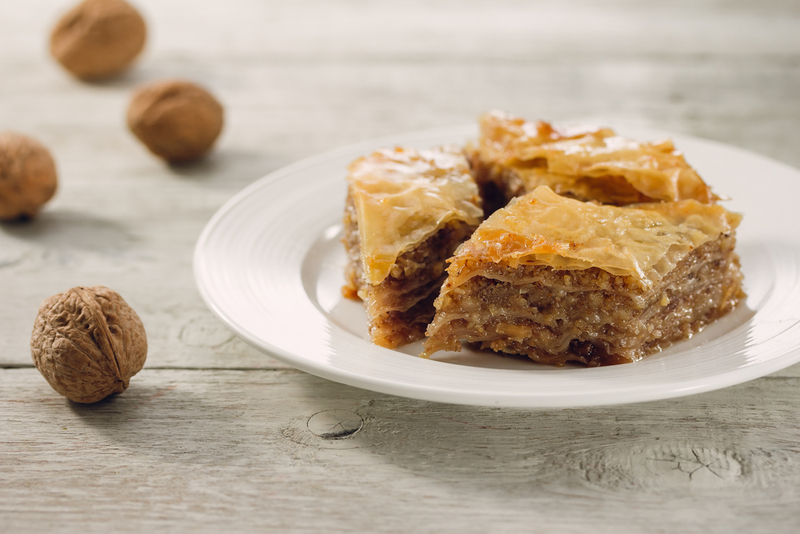 Let the baklava cool and serve.